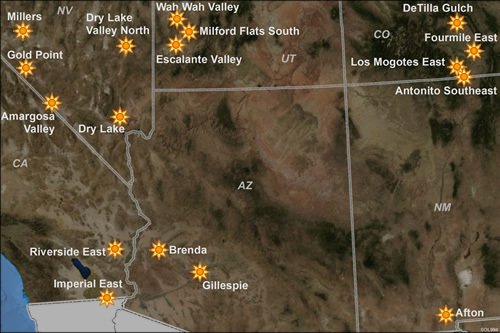 View maps and information about the 17 Solar PEIS solar energy zones (SEZs). These are the priority development areas for utility-scale solar energy facilities identified in the Solar PEIS Record of Decision. Information about the Arizona Restoration Design Energy Project (RDEP) SEZ established in January 2013 is also available. The map below shows the locations of 17 SEZs. Click the sun icons or labels in the map or follow the links below the map to learn more about each SEZ. An SEZ is defined by the BLM as an area well-suited for utility-scale production of solar energy where BLM will prioritize solar energy and associated transmission infrastructure development. A discussion of the criteria used to identify SEZs is provided in Chapter 2 (Volume 1 of the Final Solar PEIS). Modifications to the originally proposed SEZs and SEZs dropped from further consideration are described in Chapters 8 through 13 of the Final Solar PEIS (Volumes 2 through 5). Agua Caliente – This SEZ was established in January 2013 through the Record of Decision for the Arizona Restoration Design Energy Project, under the guidance of the Solar PEIS. The 2,550 acre SEZ is located near Dateland in western Arizona. Detailed analyses and a Map to support establishment of this SEZ are available on the BLM website. Interactive Panoramas of the SEZs are available for viewing in a Web browser. The panoramas allow users to navigate a virtual view of locations in or near to each of the SEZs.